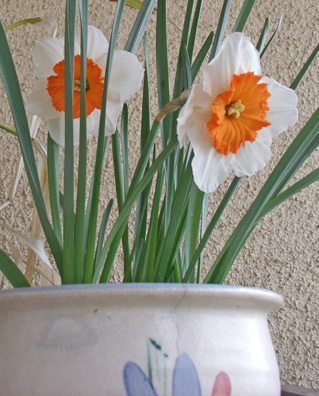 As you can see tho,Spring has it's beauty,too-these little daffodil bulbs have me burstin with pride-I got them 3 years ago in Lowes "last chance plant rack" where they were in a tiny metal container that I turned into a pincushion/notions storage tool for myself. It took three years,but they've finally bloomed! And I got my banjo armrest from Janet Davis Music,put it on myself and I now have a good,perfect playin condition instrument. Thankful I got this for such a bargain so many years ago. Banjo now stays in tune,is more comfy to play,and I won't be getting the head dirty. In my banjo decor collectin,I found this salt shaker online & had to have it-isn't she cute? Wondering how old it is-she has a spot above my office desk. I'm about to finally get into my leather crafting too-I have ideas of goodies to make to sell,and for myself as well. Been getting used leather stamps off online auctions for a song,and eventually I'd like to try making a banjo-guitar strap. For now,I'll stick with small projects. Redesigning the Blog-Muse at Work! I must confess that while the blog looks extremely well coordinated,I can hardly take credit for it. When I designed the banner,I felt my choice in the colors of the text were rather odd-not what I'd normally choose but somehow it felt right so I went with my instinct. Then I went to my fave site for backgrounds & the like and wasn't expecting to find the sunflower one-I wanted more of a cowgirl background,but they were all too dark. Imagine my surprise at the sunflower one-esp when I uploaded it and saw how professional it looked with the banner-esp the coloring of the words in the title! I'm most pleased & thank my Muse for this....and some of the other bloggers at Mary Jane's Farm forum,as I was taking a peek at their blogs & it inspired me to dress up this one. At the cottage cloudy skies have dominated this week with predictions of thunderstorms on Saturday. I've been keeping busy working on orders for Fiddle Belle and pondering what accessories can I make for banjos aimed mainly at the ladies. Sewing up fabric yo yo-s and wanting to finally get into the beginning leather crafting kit I got last fall,swearing I'd get into it right after the holidays. Well it's March,and it's time to get movin on that. I'd like to make banjo straps,we'll see how that goes. First I'll do my beginner's projects like a keyring & other such stuff that came with the kit. And-I'm continuing to unclutter and am grateful to those who are bidding on my auctions which has enabled me to move these no longer wanted items up & out. I am bringing "new" items in the house books & items that show who I am now,not who I was several years ago. I've come to realise some releasing & letting go is in order. Other crafting projects on the burner are bandana accessories. I even picked up a pattern that shows how to make a vest from a pair of jeans with bandanas as embellishments. Revamped the Blog and Ready to Write! Time goes so quickly! Last I recall I was watching the Rose parade,aware I had neglected this blog up to that point-but I felt I had nothing interesting to say,so I let it set awhile. 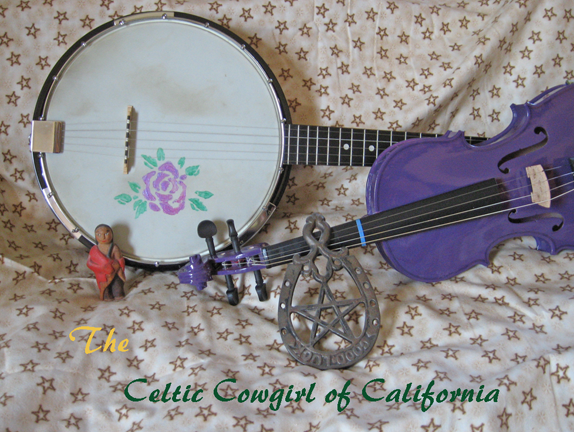 Decided on a new banner-you're probably noticing the sudden appearance of a banjo! I went with my Dad to the storage unit he has & he excavated the Peerless banjo I'd purchased in the early 1990's in another life. Sad to say the people closest to me then were a large degree of why I never got to learn-they were constantly tugging on my sleeve and I wasn't adult enough to set my priorities and say the magic word of "no". I have a friend in MO who is learning banjo and fiddle as I am,and during a conversation with Dad,he asked me why I hadn't played my 5 string banjo. I told him I wanted to,but hated to put him thru the hassle as the boxes that blocked the path in the unit were too big & heavy for me to move. "No problem" he said and we went the next day. I restrung it & cleaned it up,and am presently studying out of a Wayne Erbsen book on Bluegrass banjo. Planting has been happening here-I picked up 2 blueberry bushes and some pansies-the pansies are in my "pot o gold" planter on the porch and the blueberries are in pots in the backyard. I have red bell pepper seeds to plant as well as petunias. Sewing wise,I've went on a kick of purchasing vintage bandana patterns- and one has how to make a vest out of a pair of jeans. I've had a black floral pair for years that I had purchased & they shrunk too much so now in a sense,I'll finally get to wear them! I now have skirt patterns that use bandanas also,and I figure they'll come in handy for summer. I cut several pieces of fabric today that were big enough to make yo-yo-s with. Now I'll have some stitching to do while watching tv or talking on the phone. I can use these for countless items. They make wonderful embellishments and use of what would otherwise be scraps in a landfill. So until next time, Ride high and balanced in the saddle!